In 1776, Thomas Paine published Common Sense, the Continental Congress declared independence, and Washington crossed the Delaware. We are familiar with these famous moments in American history, but we know little about the extraordinary events occurring that same year far beyond the British colonies. 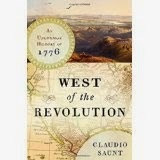 In this distinctive history, Claudio Saunt tells an intriguing, largely untold story of an immense and restless continent connected in surprising ways. In that pivotal year, the Spanish established the first European colony in San Francisco and set off a cataclysm for the region’s native residents. The Russians pushed into Alaska in search of valuable sea otters, devastating local Aleut communities. And the British extended their fur trade from Hudson Bay deep into the continent, sparking an environmental revolution that transformed America’s boreal forests. While imperial officials in distant Europe maneuvered to control lands they knew almost nothing about, America's indigenous peoples sought their own advantage. Creek Indians navigated the Caribbean to explore trade with Cuba. The Osages expanded their dominion west of the Mississippi River, overwhelming the small Spanish outposts in the area. And the Sioux advanced across the Dakotas. One traditional Sioux history states that they first seized the Black Hills, the territory they now consider their sacred homeland, in 1776. "Two nations were born that year," Saunt writes. The native one would win its final military victory at the Battle of Little Bighorn one hundred years later. From the Aleutian Islands to the Gulf Coast and across the oceans to Europe’s imperial capitals, Saunt’s masterfully researched narrative reveals an interconnected web of history that spans not just the forgotten parts of North America but the entire globe.